Control Panels do not necessarily require SCCR (Short Circuit Current Rating) labeling. Click to enlarge to see Fault Current (i.e. SCCR) labeling info. The 2011 NEC (National Electrical Code) book, section 409.110 (4) confirms that Industrial Control Panels require SCCR labeling. However, the 2011 NEC has an exception noted stating “Short-circuit current rating markings are not required for industrial control panels containing only control circuit components”. In comparing this with the 2005 NEC Handbook, this exception did not appear in this version of the NEC code. So now the question is how do you rate a panel with a 480VAC 100KA SCCR rated power circuit with control circuit components that are unrated or have only a 5KA SCCR ratings. It would seem that the panel would in this case need to be rated at 5KA SCCR. So at this point it seems that we may need to split our Control Panels into “..panels containing only control circuit components” and power panels with a suitable SCCR rating. This has been my preferred practice ever since I was restricted in servicing some 24VDC circuit because the panel also contained 480VAC motor controls. 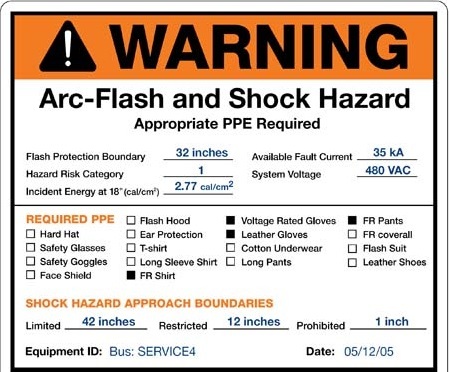 For more of my thought on this subject see “Designing for Electrical Shock and Arc Flash Safety“. My Thanks to Dave Wood at Control Assemblies in Plymouth Minnesota for pointing this out to me and forcing me to examine this for myself.